Hello Cutie, You Look Delicious! It’s been a pumpkin bonanza at the Berkeley Bowl for last few weeks. The entire front entrance has been crowded with huge boxes of pumpkins of all shapes and sizes. They even have a few giant pumpkins on display. I’ve been LOVING it, there is something really festive about that many pumpkins in one place. It puts me in an perfect autumn-y mood. Every time I walk by the pumpkin display, I can’t help but pick up one of the baby pumpkins. I go to the Berkeley Bowl at least four times a week (I live around the corner) so quite a few pumpkins have come home with me lately. Some of them are busy being adorable on my kitchen table but I’ve tried to cook the majority of the pumpkins that I’ve bought. Pumpkins are awesome because they easily lend themselves to either sweet or savory dishes. This is my second pumpkin recipe post, after writing about pumpkin pie a few weeks ago. This time around I would like to share my recipe for savory pumpkin quiche. This recipe for pumpkin quiche is my own rendition of a dish served by Gregoire Restaurant that I picked up while I worked there. 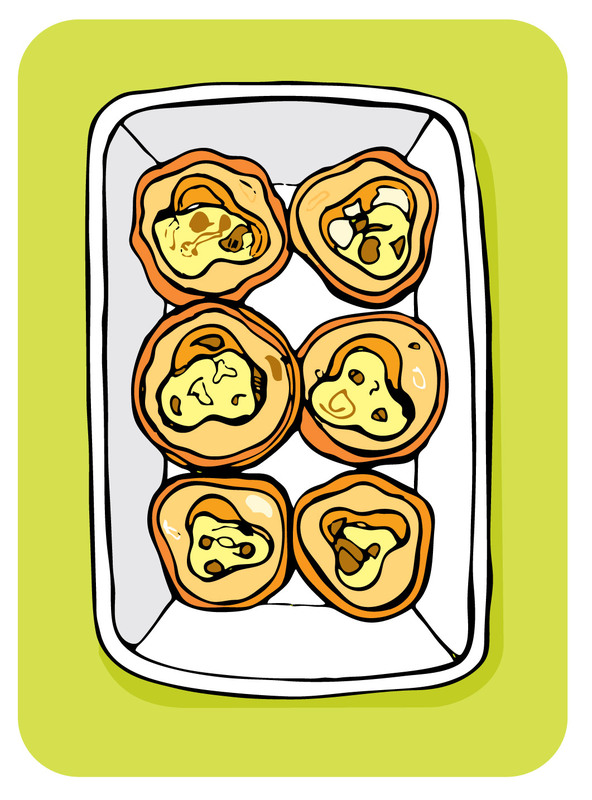 It is basically an egg quiche inside the hollow of a small pumpkin. When you eat it, you get a little scoop of the egg and a little scoop of the squash. Sounds delicious, right? Step One: Preheat the oven to 350°F and clean the pumpkins. Slice each baby pumpkin in half, through it’s equator, and scoop out the seeds. Cut the stem off the top half of the pumpkin so that it can lay flat. Step Two: Fill the bottom of a cookie sheet or baking dish with water. You don’t need much, just enough to cover the entire bottom. Place the pumpkins upside down in the dish and steam them in the oven for 15 minutes. Step Three: While the pumpkins are steaming in the oven, sauté the mushrooms and onions in one tablespoon of olive oil for about five minutes or until the onions are translucent. Step Four: After you remove the pumpkins from the oven, increase the oven temperature to 375°F. Flip the pumpkins over and place the sautéed mushrooms and onions in the bottom of the the pumpkin cavity. Slice the day old bread into small cubes and place them into the cavity along with the mushrooms and onions. Step Five: Whisk the eggs and cream together along with the salt and pepper. Use 2 teaspoons of cream for every egg. You’ll have to use your judgement for how much custard you’ll need. If your pumpkins have a larger cavity, you’ll need more. If you’re using smaller pumpkins, you’ll need less. Pour enough custard into the pumpkin cavity to cover the bread, mushrooms, and onions. Step Six: Brush the edges of the pumpkin flesh with olive oil and bake for 20-30 minutes. When the egg is set, the quiche is done! This is one of my favorite fall dishes, I hope you have a chance to give it a try. 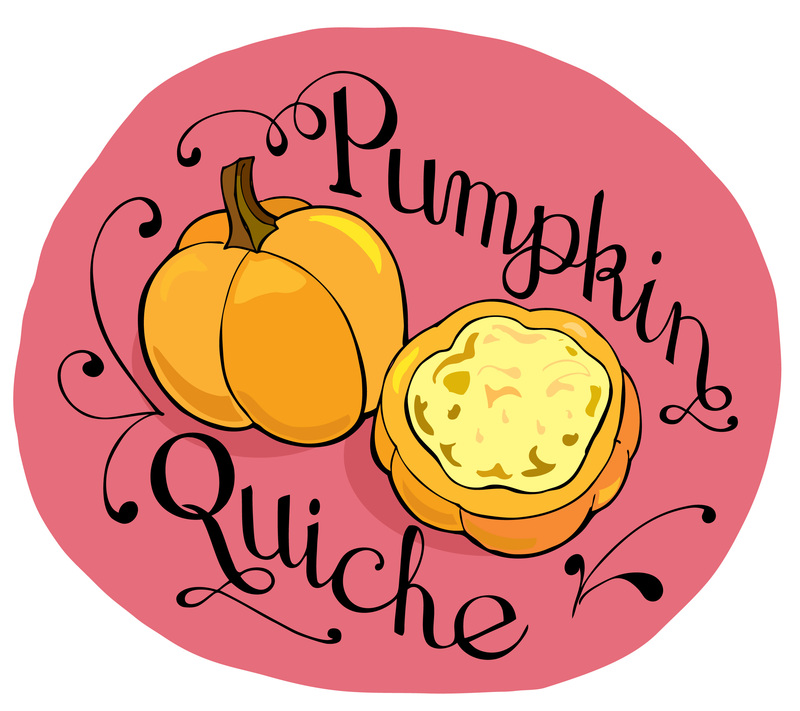 Pumpkin quiche makes an excellent side dish for Thanksgiving, as well. In the past, I’ve made it with larger pumpkins that get passed around the table and you just take a scoop out for your plate. If mushrooms and onions aren’t your thing, you can use any filling that you want. I’ve made sweet pumpkin quiche with cranberries and walnuts and a little brown sugar in the custard, and it turned out well. This is a good dish to improvise and experiment with and really make it your own. Before I go, I just wanted to share with you the finished product of the cover for the Mauitime I mentioned in my Pumpkin Pie post. You can check it out on my website heatherdiane.com. It was a fun and successful collaboration with Justin “Scrappers” Morrison. I hope you have the chance to check it out! Have a great week, everyone!